June 2, 2015 – Boeing employees in Renton, Wash., have started building the first 737 MAX on schedule for first delivery in third quarter 2017. 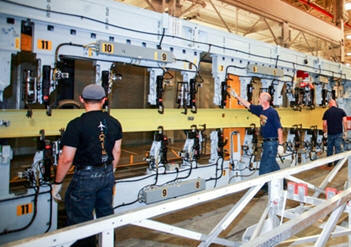 Last week, employees started to assemble the wings for the first 737 MAX flight test airplane. Wings are the first 737 components to be assembled in the Renton production process. Machine operators loaded 737 MAX wing skin panels and stringers into the new panel assembly line that uses automation to drill holes and install fasteners in the upper and lower wing panels. Mechanics also loaded the initial parts of the first 737 MAX spars, internal support structures in wings, into automated spar assembly machines. The wings will be attached to the first 737 MAX fuselage on the new Central line in Renton Final Assembly later this year. The new production line will allow the team to isolate the first 737 MAX build from the rest of production in order to learn and perfect the build process while the Renton factory continues to build at a rate of 42 airplanes a month. The 737 MAX incorporates the latest technology CFM International LEAP-1B engines, Advanced Technology winglets and other improvements to deliver the highest efficiency, reliability and passenger comfort in the single-aisle market. Beginning in 2017, the new single-aisle airplane will deliver 20 percent lower fuel use than the first Next-Generation 737s and the lowest operating costs in its class, 8 percent per seat less than its nearest competitor. To date, the 737 MAX has 2,720 orders from 57 customers worldwide.